Hankin won three England Under-Twenty-three caps and Youth caps at his first club Burnley, whom he joined in February 1973. He replaced David Johnson for his debut as a substitute on 29th October 1974, when Egland beat Czechoslovakia at Selhurst Park. He started two other games, the first in a 3-0 win against Scotland on 18th December 1974 at Pittodrie and the second on 21st January 1975 in a 2-0 win over wales at Wrexham. Prior to that he was part of the England youth team which won the 1973 European Championships. The finals were held in Italy, with England beating East Germany 3-2, after extra-time, in the final. England won Group C by defeating Iceland 2-0, Switzerland 2-0 and drawing 0-0 with Belgium. England then beat the hosts Italy 1-0 in the Semi Final and Hankin was replaced in the final by substitute Andrew Impey. Tony Waiters managed this side and later signed him for the Vancouver Whitecaps. A burly and commanding old-fashioned centre-forward who was never afraid to mix it with the opposition. Hankin started his career with the Burnley, where he scored thirty-seven League goals in one hundred and twelve League games, of which two were off the bench. He also scored once in five F.A. Cup ties, four times in twelve League Cup starts and four more in nine other games. He made his Turf Moor debut on 24th April 1973, when he came on as a substitute for Frank Casper in 3-0 home win over Luton Town. 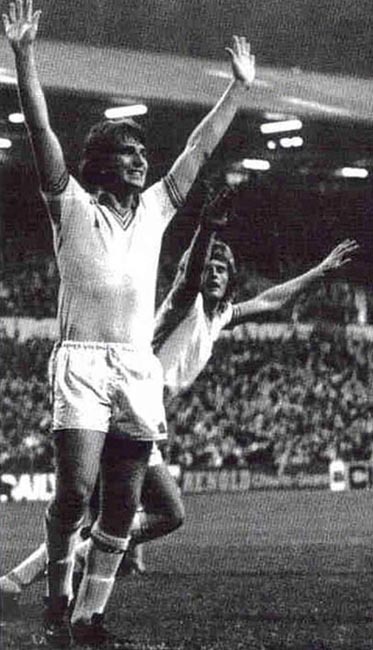 Hankin also scored the last goal ever scored in the now defunct FA Cup third place play-off when Burnley beat Leicester City 1-0 at Filbert Street on 9th May 1974. The Striker also won a Charity Shield winners' medal when Burnley beat Manchester City 1-0 at Maine Road, with a goal from Colin Waldron. He played his final game for Burnley in a 1-2 loss at Carlisle United on 18th September 1976. He was transferred to Leeds in September 1976 for £172,000, but suffered from injuries in his first season at Elland Road and only played four games. However, he certainly announced his arrival on the scene as a fearsome spearhead the following season when he was the club’s top scorer with twenty League goals. He formed a formidable partnership with Joe Jordan, until he and fellow Scot Gordon McQueen left for Old Trafford and then he was in another good partnership with Allan Clarke. The following season saw the arrival of John Hawley, and while in the League Hankin got nine, his partner hit sixteen in another fruitful partnership. 1979-80, with the departure of Hawley, saw a much different story, as he struggled with injury and loss of form as Leeds failed to find the net on a regular basis as their would-be strikers all fired blanks. After scoring thirty-six goals in over one hundred appearances, he left the club in March 1980 when he joined the Vancouver Whitecaps for £300,000 and won an NASL North-West Division winner’s medal in 1981. He scored eight goals in twenty-four appearances in 1980 and twelve in twenty-two in 1981. In November 1981 Arsenal were prepared to part with £400,000 for his scoring talents, but, although he signed on a trial basis, he was released in January 1982 without a senior appearance. The best he could muster at Highbury was two substitute appearances against Liverpool in the Fourth Round of the League Cup in a 0-0 draw at Highbury on 1st December 1981 and a 0-3 reversal at Anfield in the replay on 8th December 1981. After a brief spell at Shamrock Rovers, after being signed by Johnny Giles in January 1982, where he notched two goals in five matches, after scoring on debut against Sligo on 24th January 1982, he returned to Vancouver for the rest of the year of 1982. He improved his record for the Canadian side and scored a further eleven goals in twenty-seven appearances. He spent a toptal of three seasons with the Vancouver Whitecaps scoring thirty-one goals in seventy-three games. He then joined Middlesbrough for £80,000 in September 1982, where he scored once in twenty-one League games, two of which were as a substitute and also another unused substitution. He also scored once in two starts in the League Cup and once in four starts in the F.A. Cup and sat on the bench unused in one. His debut for Boro, on 22nd September 1982 at home to Grimsby Town, saw Boro go down 1-4 and he and Mick Kennedy were sent off and to cap it all Manager Bobby Murdoch was sacked the same evening, with Malcolm Allison later succeeding him. He made his final appearance as a substitute at Leicester City, when he came on as a seventy-third minute substitute. His next club was Peterborough United, who he joined in September 1983, scoring eight League goals in thirty-three games, two being from the bench. These were not Hankin's finest hours and he gained the dubious distinction of being sent off five times in eight games as he found himself a marked man in the lower echelons of the Football League.Then it was on to Tommy Docherty's Wolverhampton Wanderers in March 1985 for three months where he scored once in nine starts, and one from the bench, League appearances. He debuted at Charlton Athletic in a 0-1 defeat on 12th March 1985 and as both he and Wolves found goals hard to come by he scored his only goal in the eighty-fifth minute of a 1-4 defeat at Notts County on 23rd March 1985. Wolves were to be his final Football League club as his contract was cancelled after just five months with almost eighteen months to run. He stepped down into Non-League football with David Harvey's Whitby Town in October 1985. He made his debut against Brandon United in the Northern League Division One on 12th October 1985 as Whitby had a good F.A. Cup run which saw them go down 2-3 to Doncaster Rovers in a Replay in the First Round Proper on 18th November 1986.He moved to Newcastle Blue Star in December 1986 and stayed until June 1987. It was then on to Guisborough Town where he was made Captain, which led to an incident which added to his list of Red Cards, it came when he had led the club into the First Round Proper of the F.A. Cup. In front of a 10,000 crowd at neutral Ayresome Park on 19th November 1988, they went down 0-1 to Bury of the Fourth Division. Although Bury had got their goal in the third minute, Guisborough had been on top as they pressed for an equaliser, when in the thirty-seventh minute, after Hankin had been denied what he thought was a blatant penalty, Hankin got into a heated argument with the referee after his captain's armband had come off and for protesting too much, he was sent off. He worked in a mental hospital near Middlesbrough while playing for Guisborough Town in 1987, his last club before retirement. He did play fleetingly for Sherburn Village WMC, in the Durham and district Sunday League when John Ord was the Manager. Hankin Played in League Games and in a Alan Smith Memorial Cup Final for Sherburn at the Old Ferens Park in 1988, against Trimdon Village WMC. Throughout his career the powerfully built Hankin was always capable of scoring with his head, but was not as adept when the ball was at his feet. A highly combative forward he stood on no ceremony and his career was littered with red cards as the result of his inability to control his temper. He never quite lived up to the potential he showed at Burnley and fleetingly at Leeds as he was not able to control his weight or his temper. He was appointed manager of North Allerton Town in March 1989, and took them to promotion to the Northern League First Division as runners-up in his first full season. 1990-91 saw them consolidate their League position, but Hankin resigned at the end of the season and was replaced by his Assistant Geoff Cane. He then joined Newcastle United where he became their Football in the Community Officer. This ended in him being made redundant before taking the club to an industrial tribunal, settled hours before the hearing. He returned to Northallerton Town as Assistant Manager to the Geoff Cane for the 1993-94 season. The club folded in 1994. He later joined Darlington as first youth-team coach under Frank Gray and then was briefly handed the managerial post at Feethams in February 1992, but failing to stop the financially-crippled Quakers dropping down to Division Four and left in May 1992. He now works as a support worker looking after people with learning disabilities. “But I’m always open to offers and I’ll go back in the game if I was offered a decent manager’s job or scouting job or whatever. At the minute, I’m putting something back into life really with my work, which is what I always wanted to do. I’ve fantastic memories of my football career since I was a kid at Burnley and was involved in football 25 to 30 years. I loved every minute of it, but know I’ve still got a lot to offer.” is his present philosophy.